BNP group wished for Modern and contemporary spaces, ambience - one of its kinds in the region to be appreciated by the visitors and staff. After exhaustive site analysis and intense dialogue with the clients the design approach was an inspiration of Chennai as a city / neighbourhood / home and this formed the metaphor in the design of the workspace. Team Edifice struck on the idea of using the “GLOCAL” as the theme for the project, keeping the fact in mind that BNP Group is a Global company setting up an office in India, Chennai (the local context). Brief demanded local context and character study. Based on the same modern and contemporary Space were created, which had local influence but was global in character. The entire office is on a raised access floor finished with bright, staggered carpet. The spine has rafter ceiling which, visually pierce into the enclosed spaces making the spine corridors look wider. The open office have modular ceiling with linear light fixtures integrated within the ceiling. 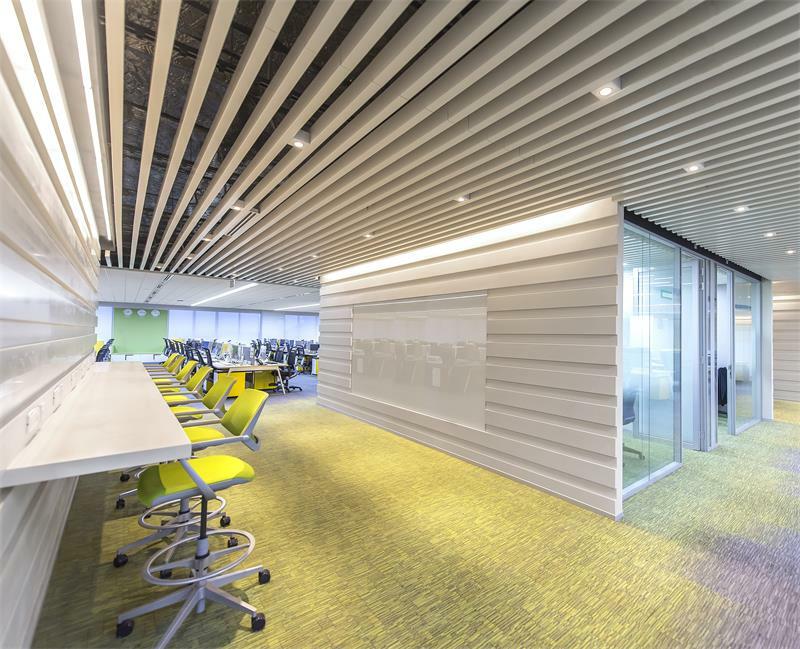 This created a visually subtle ceiling space and the modular workstations below added the colour vibrancy over the dark grey carpet base. The cross walls were finished in a corrugated profile and were made of corian which is a very sturdy and abrasion resistant material. This added the desired gloss at the various cross overs. The central collaborative zones have a different character, due to the use of different ceiling and flooring material, which provided the much needed relief for the 2 packed work-zones. Typical floor plates had three different types of collaborative zones with different furniture setting. One was an open lounge to enable small team meeting with the facility to project TV screen. Few were a touch down counters with high stools to provide an alternate workspace or facilitate the working of people who come from other BNP offices for short term. The various dead walls have been planned for local art work graphics indicating the local influence on the modern setting of the office floor, which adds to the “Glocal” flavour.